When I decided to do a “green” blog challenge as my fundraising pledge, I figured a daily commitment would be easier to stick to than a weekly one because I can’t procrastinate. It has its downsides from a content perspective — lack of time to fully develop arguments with good sources, or to edit properly (I also don’t use spellcheck). But generating a daily post means I get it done without getting caught up in perfectionism or letting ideas become stale. I hope ultimately that, among unexpected duds, my content is better. 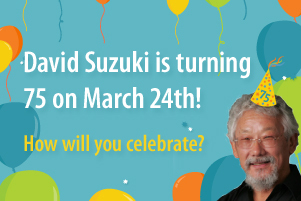 David Suzuki is turning 75 on March 24. To celebrate this momentous occasion and honour his life’s work, the David Suzuki Foundation invites you to make a gift or fundraise online to support the Foundation’s work, and send a personal message to David. There are prizes involved, and those coaxed me into signing up. But I was at a loss for what pledge to make in return for my friends’ generosity. Jenny has pledged to bike the 60+ km round trip to work and back. Siri has promised to avoid shopping sprees until the big day. It got me thinking about what change for the greener I could make, and it wasn’t easy coming up with something — not because I’m unwilling to make lifestyle changes, but because I’ve made so many that I was struggling to find something new. I know my showers could be shorter and I really ought to shut down my old iMac hog at night. I’ll come around to a permanent commitment to those eventually. I eat four or five bananas a week, my cheese comes wrapped in plastic (I eat a lot of cheese) and I’m kind of addicted to the internet. (Just kind of.) I could change one of those for a little while, no big loss for a little bit of gain. But this isn’t about guilt, it’s about inspiring people and doing something meaningful. First, though, I have to inspire myself. So I’m going to write a blog post about the environment every day until I reach my fundraising goal of $300. Just look at my sporadic track record: I’m going to need all the moral support I can get! I may get carpal tunnel, avoid social occasions and frequently skip flossing in order to keep this up — but it’s David’s 75th and I believe very strongly in the work he and his Foundation does. 3) Look for your personal message to be displayed at HappyBirthdayDavidSuzuki.com within a couple business days of your submission. I invite you to join me and write your own blog post or comment here about what you’re doing for the environment and why. Or conversely, if you’re not doing anything, why not? I won’t guilt trip you; I’m seeking to understand. Also, if you’d like to request an eco topic about which you’re yearning to know more, leave a comment and I’ll consider it for a future post. Thank you in advance for supporting the cause that is so very dear to my heart, and valuable to the majority of Canadians. * It’s easy to donate online at HappyBirthdayDavidSuzuki.com. To send David a message without donating, write to contact@davidsuzuki.org. Three years ago today, I started a blog at Blogger and didn’t really have a name for this new “thing,” didn’t know where it was going, and didn’t know precisely what to write about. 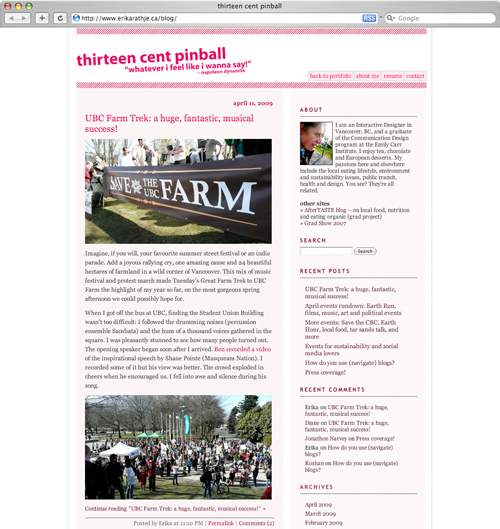 I’m still writing about topics almost as broad as my own interests, and frankly, I don’t think I know much better where it’s going but at least it has a name: thirteen cent pinball. About eight months ago I decided to upgrade my blog from Movable Type version 3 to the much improved 4. In the process, I wanted a wider page with larger font, bigger images, a cleaner and easier commenting section, and better typography. I wanted to eliminate extra steps and hurdles for users, and streamline my own process for updating content across the blog and eventually my portfolio as well. Last night I finally attended my first Philosopher’s Cafe, on the topic “Sustainability—is it compatible with free markets?” It was a good discussion and, despite us all being pro-sustainability, we still differed on enough views to promote some argument. I’m an idealist but used my realist friends’ perspectives to offer some critique. (Sorry that you weren’t there!) I won’t make it to the next one at that location, because there is one that interests me even more in New Westminster: “The ethics of the hundred mile diet” is on April 15 at Heritage Grill, 7pm. A discussion on “GMOs: The complex difficulties of Frankenfood” happens there June 17… but that’s a ways off! Here are a couple upcoming FREE events for folks interested in sustainability and social media. Register online for the first portion beginning at 1pm, or come down at 6pm for some casual conversation. 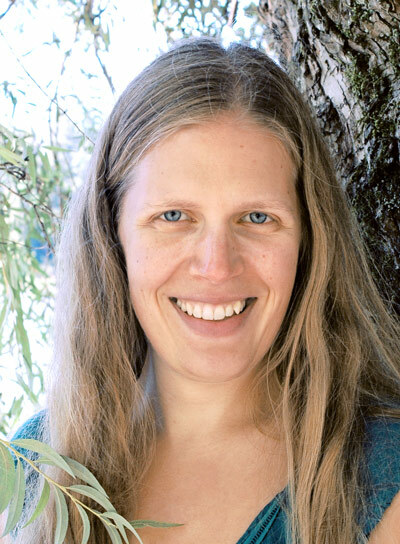 Vancouver Net Tuesdays – Remixing the Web for Social Change! Net Tuesday is a regular gathering of bloggers, social media folks, designers, non-profits and other folks interested in the role of the web for social and environmental change. It’s been going on in Vancouver for about a year. Host/MC is Darren Barefoot. Yay! I’ve been working for awhile on giving my blog design a facelift. As tends to happen with design projects that are drawn out at length (as is the case when it’s not my full-time work), I know more at the end than I did at the beginning. I mean, yeah, that’s supposed to happen, naturally, with any project, but these ones that would otherwise be condensed into a short time frame take place over the course of months that are packed with learning that occurs outside their context. That learning tends to fall into either design (look at how much better I’ve become!) or programming (look at what I’ve learned how to do!). Sometimes it’s outside influences like new technology that didn’t exist before, or of which I did not know. Well, this time around, it’s not so much my visual skills or my technological skills, but my thinking that has changed and grown since I embarked on this miniature quest. And it’s quite, quite recent. Blogs and websites are constantly evolving. As a result one can probably expect users to be evolving too — in fact, with the presence of RSS readers, we hardly need spend time on people’s blogs in our web browsers save to comment. User behaviour changes with technology. This is clear. So when I have a model for my blog that is almost 3 years old, I have to wonder… what is still relevant? What features do users actually use and how do they find information? I googled this already but Google help me I didn’t find an answer. That, therefore, is where you come in. The question I pose you is: how do you use blogs? When you arrive at a post, what helps you move on to another post (assuming you enjoyed the content or found it helpful)? How do you navigate the information — through tag clouds, categories, recent comments? Are lists overwhelming or redundant? Your feedback will help me determine what features are of most use to you when you read my blog. Thanks in advance for helping me out. A side note: in its next incarnation, I expect comments to appear immediately on thirteen cent pinball. Hooray! The facelift is a modernization, rather than a redesign, so the overall visual “flavour” of the blog, if you will, shall remain the same. 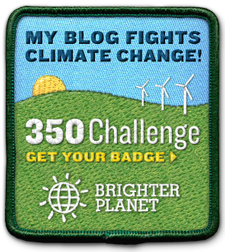 I encourage you to sign up to put the nifty, fun badge on your blog, too.